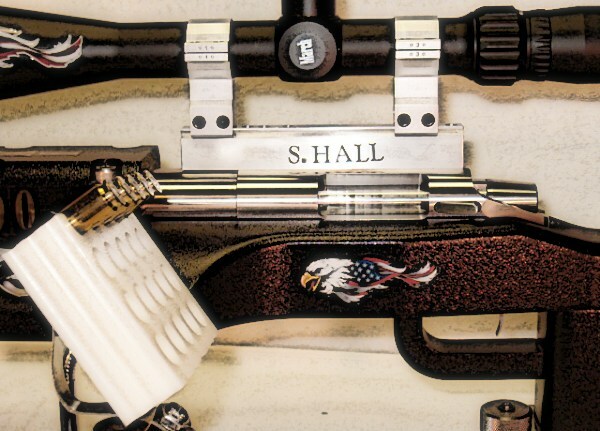 By any measure, Sam Hall is one of the greatest middle-distance benchrest shooters on the planet. 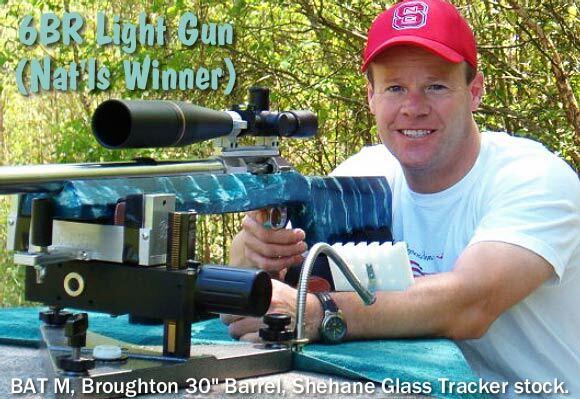 Holder of NINE world records, Sam won the 2008 IBS Nationals, and ended the season as the 2008 IBS 600-yard Shooter of the Year. Until recently, Sam has competed mostly with conventional 3"-wide LG-style rifles in BOTH Light Gun (LG) and Heavy Gun (HG) classes (but with added weight for HG). But Sam always wondered if "bigger was better", and now Hall has truly embraced the Dark Side, switching to a massive new Heavy Gun chambered for the 6mm Dasher. Hall's new ?ber-gun is a 60-lb monster he calls "Black Max". 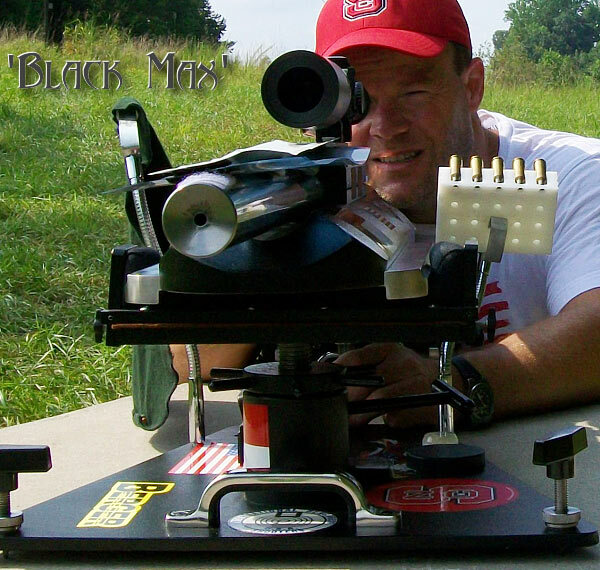 Shooting Black Max, Sam recently smashed the 600-yard, IBS 4-target HG Aggregate record with a 197 out of 200 score. 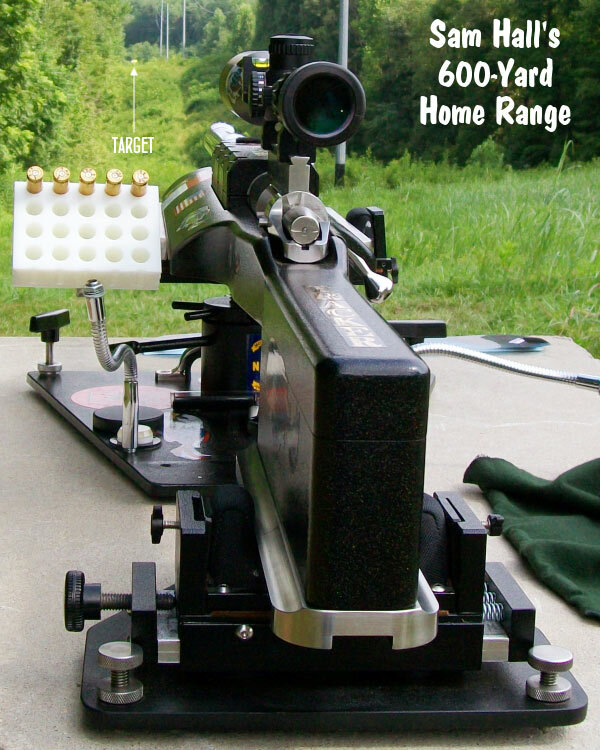 That's the highest Aggregate score ever shot at 600 yards in either LG or HG classes. Sam observes: "Before starting this project I wondered if the true Heavies had a place in 600 yard benchrest. Now I believe they do&." Project Origins -- Would Bigger Be Better? Last year, during the 2008 IBS 600-Yard Nationals, Mike Davis and I discussed the merits of building true Heavy Guns for 600 yards. We considered putting together 60-pounders with rails and barrel blocks like the guys have been using for years at 1000 yards, but having them chambered as a 6 Dasher or 6 BRX. Both Mike and I had been thinking of this idea for some time. We wondered if 60 pounds would be too much weight for such a small cartridge with relatively light recoil. We knew the rifles needed to move during recoil or they probably would not shoot. I had a donor rifle that could be used for a Heavy Dasher project -- my old 1000-yard Heavy Gun had been for sale for over a year at Leonard Baity's shop in N. Wilkesboro, NC, with no takers. This was a 6.5-284 in an aluminum Shehane Maxi-Tracker stock, complete with the front/rear rests Leonard had built for this rifle. But I still needed an action and a barrel. As luck would have it, at the Nationals I won two, half-off Brux Barrel certificates. Mike observed: "Sam, there is your barrel to put on the HG project". I knew Mike and some of our fellow shooters had spoken highly of Brux barrels. As soon as I got back home from the Nationals, I called Leonard Baity and told him to not sell the Maxi-Tracker or its rest. I called Norman at Brux and ordered a 6mm, 1:8.5" twist barrel long enough to finish at least 30 inches. Luckily, before the barrel arrived, I ran across a used BAT Model 'S' (6.5"), 1.55" action, set up RB/LP-right micro eject. I figured this action would work much better than the 8.5" Model M I was using with the 6.5-284. (That 8.5" Model M action was not made to eject BR-sized cases as it did not have the Sako-type extractor BAT now installs for the BR case.) So I bought the Model S and sold the Model M. I sent the barrel and action off to Leonard Baity to be fitted to the Maxi-Tracker stock. In a few weeks Leonard had the rifle done. Leonard's work, as always, was top notch. The rifle, which I call "Black Max", weighed in at 61 pounds, complete. This would truly be a Monster Dasher. This 60-pounder is a pleasure to shoot. The recoil is so minimal I can pin-point the bullet impacts on the sight-in bank. I can say, after shooting this rifle nearly a year, it shoots much better at 600 yards as a 6 Dasher than it did as a 6.5-284. In good conditions& this rifle can now Agg under 2 inches for four, 5-round targets. The Maxi-Tracker features stainless steel rails front and back. The rails only contact the bags about an inch per rail for less friction. The front rails are set 8" apart while the rear rail unit is 3" wide. As with all his stock designs, Bill Shehane did a lot of research before producing the Maxi-Tracker and it shows. With a good rest set-up the stock works remarkably well. My only complaint is that, at 61 pounds, the gun is a handful to carry to say the least. Bill is now making a lighter, laminated wood version (with the same rails and barrel block) that weighs about 45 pounds. That would be more manageable. The wood is also supposed to soak up the barrel vibrations better than the aluminum version also. The action is a BAT Machine Model S, RBLP right micro-eject action, measuring 6.5" in length and 1.55" in diameter. The bolt is non-fluted. I've owned several BAT actions, and all were slick, but this is the slickest one I've ever had. The trigger is a 2-ounce Jewell. Forward of the action is the massive 8"-long, vertically split, low-profile barrel block. This secures a fat, 1.445"-diameter Brux barrel. That diameter was very important. The 1.445" spec leaves a few thousandths room for the epoxy between the barrel block (1.450") and the barrel, so there is no binding. Dimensionally, the 1:8.5" twist, .236 bore barrel came in just as I had ordered and finished out at 32 inches. Leonard Baity made the +10 MOA scope mount, a high-rise Kelbly-style rail that allows the scope to clear the barrel block. On top the mount, in Kelby double-screw aluminum rings, is a 10-60X March variable scope with 1/8th MOA adjustments. This is my second March; they are the clearest scopes I have ever seen through. Some may question whether one needs 60X magnification for 600 yards. Yes, you CAN use that much power. Heck, I even put a Gene Davis (BulzEye Pro) optical booster on it. This boosts the power to 78X. But, the only time I can use 78X is very early am, before ANY mirage get up. As the sun gets up, and mirage appears, I back it up to 40-50x. I do like to see the mirage so I can judge what direction it is flowing, but I don't want so much mirage that it interferes with my point of aim. That is what I like about the variable March. I can back it down when needed. Good rests are a critical part of a true heavyweight rifle system. Leonard Baity had made the rest system for the stock a few years ago. The front bag sits on a 1" post and adjusts for rough elevation. It is set up for a 8"-wide fore-end. The 3"-wide rear rest adjusts for windage and has a speed screw for fine elevation. Under IBS rules the front and rear rests must be separated while shooting. However, I had a local machinist make a center bridge that makes the entire rest one unit for transport and setting-up. This center bridge also keeps the front rest and rear rest squared up and positioned the same distance apart every time. When I have finished setting up the rest on the bench, I just back off four screws and pick the center section up out of the way. I also added a Delrin cartridge holder on the left side beside the port. This attaches to an adjustable arm from a desk lamp. I have less than $15 in that setup. On the right side of the front rest I mounted a small curtain to catch ejected brass. Once Black Max was completed, I quickly put a few loads together that had worked for me at 600 yards in my 6 Dasher Light Gun. I tried two bullets, Berger's new 108gr BT and the "old standby" Berger 105gr VLD. In my experience, if your 6mm gun won't shoot one of these bullets well, chances are it won't shoot anything well. I loaded 32.0, 32.5, and 33.0 grains of Reloder 15 with both. I seated the 105 VLDs just off 'hard jam' (square marks on the bullet), and seated the 108gr BTs about .010" off the lands. Typically, those are the sweet spots for these two bullets (just like Berger says). 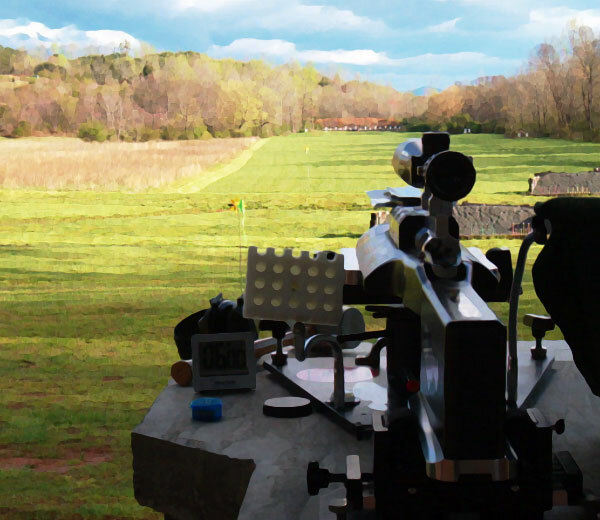 I zeroed at 100 yards, then went right to 600-yard testing. I shot the 105s first with the 32.0 grain RL-15 load. That load shot about 3 inches, not so great by my standards. I started to think maybe this 60-lb monstrosity was not going to shoot. The 105s did not shoot well until I tried the hotter 33.0 grain load. Bingo, 33.0 produced a 1.6-inch group with the 105s. But, the best was yet to come -- when I shot the 108 BTs. The 32.0 grain load produced a 1.032" group and the 33.0 grain load produced a 1.2" group. I went with the lighter load since this was December and I would be shooting in July and August. That was all the load development I originally did for the rifle. It usually is not that easy. During load development, I usually adjust the seating depth also, but Black Max shot so well that didn't seem necessary. I must say a few weeks later I adjusted the seating depth to tweek the load, but found out it did not like the 108gr BT Bergers close to the lands or further away. My original load shot best. This 60-pounder is a pleasure to shoot. It actually moves more than expected under recoil -- close to an inch rearward. All I have to do it move it up until it hits the stop underneath the stock. If it is tracking perfectly, it will be right where it was on the previous shot. If it does not track perfect it is rarely more than an inch off. I make a minor adjustment and fire again. The recoil is so minimal I can pinpoint the bullet impacts on the sight-in bank. I believe this helps in score shooting. 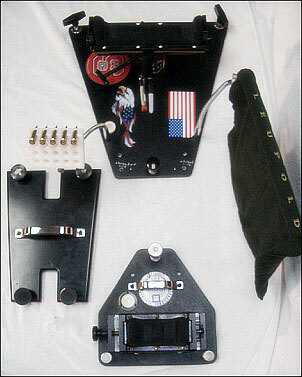 I have used a Farley Co-Axial II joystick front rest on my Light Gun for years. It has taken this whole year to get used to the rear adjustable rest on the heavy gun. I still am not as confident and as quick in making fine adjustments for changing wind as I am with the Farley. For back-up use with the Farley, I've decided to take my "light" Heavy Gun back to the Nationals this year -- the same rifle I used last year in Heavy class. This is a 28-pounder in a weighted Shehane ST-1000 stock. It now has a Brux barrel chambered in 6 BRX and as well as the 6BR did last year. I can say after shooting this rifle nearly a year, it shoots much better at 600 yards as a 6 Dasher than it did as a 6.5-284. In 2005, I tried all year at 600 yards shooting it as a 6.5-284 with 140 Bergers and 142 SMKs. I only had one group (not an Agg) under two inches all year, a 1.998" group. As a 6 Dasher, this rifle can Agg under 2 inches for four 5-round targets. That's in good conditions, when I'm doing my part. In the video below, Sam Hall offers invaluable advice on how to set up and steer your rifle for the 600-yard Benchrest game. Trust us -- what Sam reveals in the video is gold. We almost guarantee that if you listen carefully, you'll learn many important tips that can improve your score. Unfortunately, as Sam never attended film school, the production values of the video aren't so hot. But Sam's advice is money in the bank for a 600-yard BR shooter. 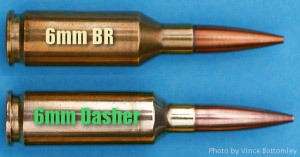 My match 6 Dasher loads are made from weighed-sorted Lapua brass, neck turned to 0.266" with a K&M neck turner. I do full case prep. First the primer pockets are reamed with a Sinclair pocket uniformer and deburred on the inside with another Sinclair tool. Next, the flash holes are opened to 0.625" with the Sinclair flash hole reamer. To size the brass, I use a bushing-equipped Redding Type 'S' full-length sizing die with an old RCBS Rockchucker Press I've had for 30 years. I use a .264 Redding bushing, but leave part of the neck unsized (at the bottom). I use CCI-450 magnum primers seated with a Lyman hand tool. The 108gr BT Bergers are loaded with a Wilson seater on a Sinclair arbor press. The powder charge is 32.0 grains of Reloder 15 thrown from a Harrell's powder measure and weighed carefully on my 30-year old RCBS 5-0-5 scales. I clean the primer pockets every time I shoot them with the same Sinclair primer uniformer tool. I also clean the inside of the necks each time with a nylon brush in a high speed drill. There are many different cleaning rituals. You need to learn what your own particular guns demand. Here is my procedure. I clean the barrel every 20 shots or so with TM Solution. I use two soaked patches, then brush the bore 8-10 times with a bronze brush (all the way through and out all the way). After brushing, I used another soaked patch followed by a few dry ones to dry the bore out. I occasionally use Iosso paste in the throat if I feel dragging in the throat area when cleaning. That means carbon is building up. As a final step when cleaning the barrel, I'll run a patch with 2-3 drops of a light oil such as Kroil or Montana Extreme Accuracy oil. I then mop out the chamber to get any oil or cleaning fluids out. That is a very important step. Then I am ready to shoot. In July of 2009, shooting my 60-pounder, I set a new IBS Heavy Gun Score Aggregate record, 197 out of 200 (four, 5-shot groups, maximum 10 points per shot). The 197 represents the highest Score Agg ever shot in either Light Gun or Heavy Gun IBS 600-yard competition. Based on the Heavy Gun results at Piedmont Gun Range, it's clear that the "monster gun" experiment has worked out for both Mike Davis and myself. Mike and I have both been in the winner's circle and now his "monster" and mine each own an IBS 600-Yard HG World record -- the HG Group Aggregate for Mike and the HG Score Agg for me. "True Heavies" have turned in other memorable performances this year at Piedmont. In May 2009, when Mike shot his 1.46" HG Group Aggregate world record, I came in second with a 1.76", and Rodney Wagoner shot a 1.80". That's the first time I can remember three top finishers all shooting Aggs under two inches, and it took "True Heavies" to do it. Before starting this project I wondered if the true Heavies had a place in 600-yard benchrest. Based on my experience this year, I believe they do. I must add that you definitely don't have to have one of the monsters to win. A good 17-lb Light Gun can definitely win in both Light and Heavy classes. But if you are like me, and like to experiment, the 60-lb Heavy Guns sure are fun to shoot! Sam Hall has been remarkably successful in recent seasons, setting many records, and winning the IBS 2008 Nationals. Though Sam is a superb trigger-puller, he can also trace his success to a collection of superbly accurate rifles. The first two shown below, his blue Tracker Light Gun and orange Tracker Heavy Gun, carried him to the 2008 IBS Shooter of the Year title. The handsome wood-stocked rifle is Sam's favorite Light Gun this year. 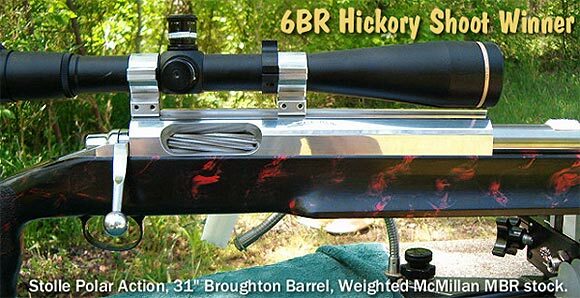 Last but not least is the heavy 6BR that won the 2007 Hickory Groundhog Shoot, with the highest score ever. 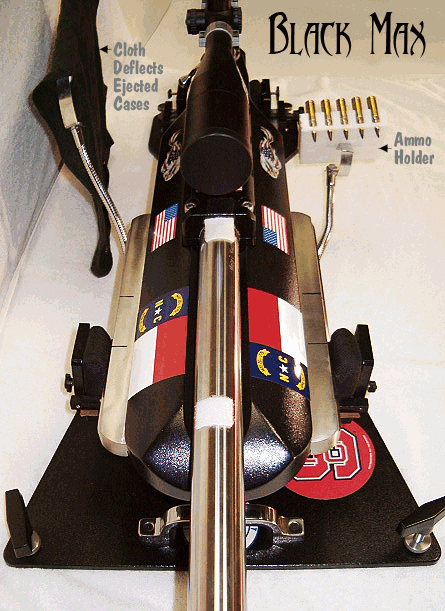 Here Sam sits proudly behind the 17-lb, 6BR Light Gun he steered to victory in the 2008 IBS 600-yard Nationals. It features a Shehane ST-1000 Tracker stock, BAT M dual-port (multi-flat) action, and a Leupold 45x competition scope. The barrel, fitted with a Vais muzzle brake, is a 30" Broughton, 1:8" twist with Tim North's 1000-yard contour. Tom Dickson at BAT Machine did the gunsmithing. Sam's match load was either a Berger 105gr VLD or a Spencer 103gr BT seated 0.010" in the lands over 31.2 grains of Reloder 15, with CCI BR4 primers, and Lapua brass. The orange rifle is Hall's 2008 Heavy Gun, a 28-lb 6BR. Fitted to the lead-filled Shehane ST-1000 Tracker stock is a BAT MB dual-port (multi-flat) action. The 31" barrel is a fluted, 1.25" straight contour, 1:8" twist Lilja. Leonard Baity smithed the gun, chambering it as a standard 6BR with 0.268" neck. In this gun, Sam loaded Berger 105gr VLDs .010" in the lands, with 31.0 grains of Reloder 15, and CCI BR4s, in Lapua brass. Sam adds: "For this gun, I now have an 8-twist, 30" Brux barrel (1.25" straight contour), chambered as a no-turn 6BRX. Mike Davis put the 6BRX barrel on for me after the Nationals last year. It shoots just as good as the 6BR did!" Hall is shooting this tiger-striped beauty in Light Gun this season. It features a Terry Leonard Redwood and carbon-fiber stock. Sam reports: "I visited Terry in 2007 and talked about this design. He already had a 1000-yard design on the market. We decided to incorporate a lower profile buttstock like he uses on his short-range stocks. This would let the rifle ride even lower in the bags. The fore-end is parallel to the underside of the buttstock for better tracking. Terry also glued in the BAT MB dual-port action." The barrel is an 8-twist, 29" Krieger, HV contour, with an 0.237" bore and Vais brake. The gun was chambered as a .268" neck, .104" freebore 6mm Dasher by Mike Davis. For this Leonard-stocked LG, Sam loads Berger 108gr BTs, just touching the lands, over a very stout load of Norma 203-B powder, with CCI-450 primers and Lapua brass. Sam is also currently experimenting with the new BIB 108gr boat-tails. Above is Sam Hall's 24-pound Egg Shoot and Groundhog Match rifle. With this lead-weighted rig, Sam won the 2007 Hickory Groundhog Match with a 98 score -- the highest total ever shot in the Hickory's 27-year history. The gun features a 1993-vintage, 14"-long Stolle Polar dual-port action. Sam bought the gun used but re-barreled it. It now wears a Broughton 31", 1.25" straight contour, 8-twist barrel. Leonard Baity chambered the gun as a standard 6mm BR with a .268" neck, and .104 freebore (Kiff reamer). In this rig, Sam shoots Berger 105gr VLDs seated .010" in the lands, pushed by a hot load of Reloder 15, fired by CCI-BR4 match primers. 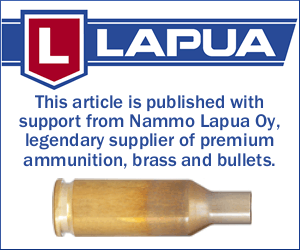 Lapua brass of course. The scope is a Leupold 45x Competition. Copyright ? 2009 6mmBR.com | AccurateShooter.com, All Rights Reserved. TOPICS: Sam Hall, IBS, Shooter of Year, 600, 600-yard, 600 Yards, Heavies, Heavy Gun, Light Gun, HG, LG, Hickory, Hickory Groundhog, Egg Shoot, Benchrest, BR, 6BR, 6mmBR, Norma, 6mm, Dasher, 6 BRX, BRDX, Reloder 15, RL15, Varget, Norma 203B, 203-B, Broughton, Krieger, Lilja, Shehane, Tracker, McMillan, Leupold, BAT Machine, Mike Davis, Leonard Baity, Berger, BIB, 108, CCI, CCI 450, CCI BR4, Lapua, Stolle, Polar, Terry Leonard.